Adding a strategy component can alter a project’s outcome entirely. Fulcrum Property had an ambitious plan to redevelop the waterfront in West Sacramento and create an wholly new district. The existing industrial and largely bare landscape was envisioned as a mixed-use destination for the area’s residents and visitors, with extensive residential, office and retail developments. The client came to us for the requisite marketing materials, however, it was apparent to us that the project required a full strategy component to bring structure and clarity to their vision. The strategy phase included a Positioning Workshop, Summary Report, and Brand Tool Kit (Messaging Deck, Persona Cards and Brand Stories). Once everything was in focus, we produced a strategy book – a tangible expression of the overall The Bridge District brand vision. This strategy phase altered the course of the project in three key ways. First, the Positioning Workshop brought together all of the key stakeholders and played a critical role in aligning their thinking. Second, it created a solid roadmap for the key project messaging. Third, it provided an essential communications tool to outline for the public and the press the core project attributes, assets and overall vision. 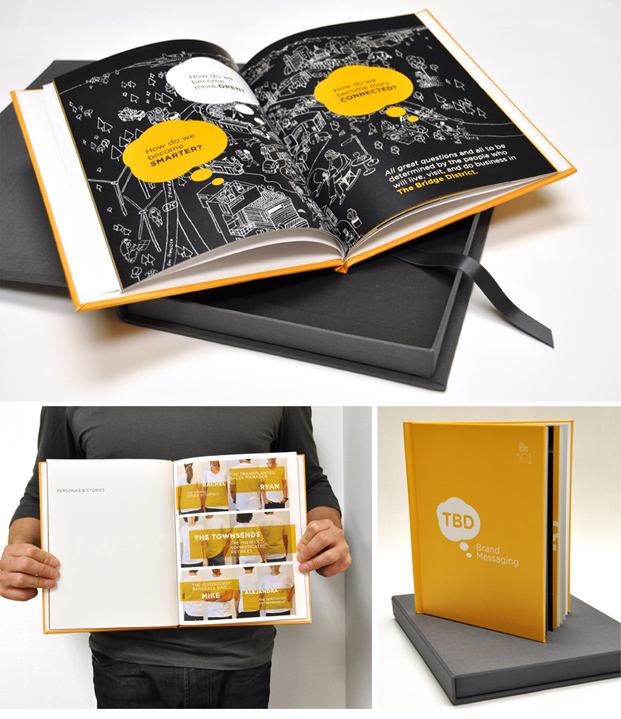 We delivered the final strategy product as a custom hardcover printed book, encased in a linen box. Who said strategy isn’t tangible?